Bloomington-Normal leaders expect Rivian to provide a huge boost to the local economy once it begins production of its first EVs in 2020. Rivian has promised to bring hundreds of jobs to the Normal manufacturing plant formerly occupied by Mitsubishi Motors, in exchange for millions of dollars in local and state tax breaks. 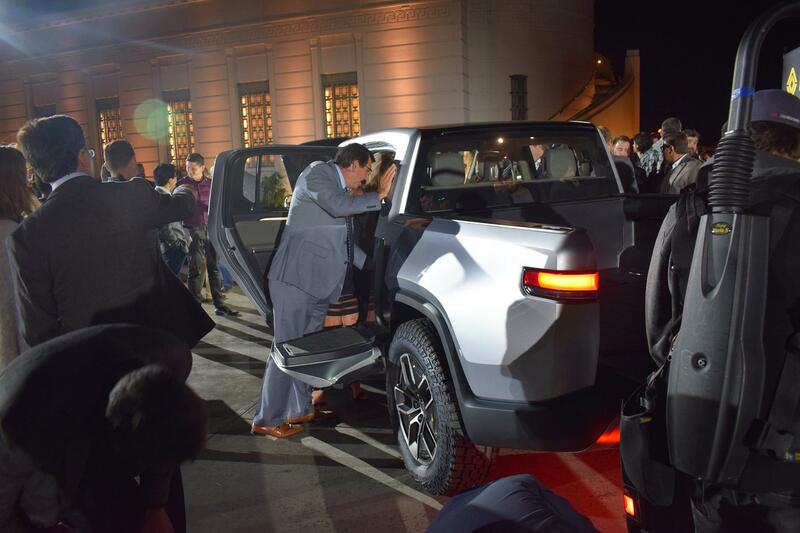 Rivian investors and other insiders take a look at the new R1T pickup truck Nov. 26, 2018, at Griffith Observatory in Los Angeles. But before any of that, Rivian needs customers. Customers like Smieszek. Smieszek follows the EV industry and heard whispers about Rivian. But it wasn’t until their LA Auto Show debut in November that he actually saw Rivian’s first vehicles. He did some research and eventually plopped down the $1,000 deposit for the SUV. “I was just kind of fascinated by their story and how long they’ve been figuring themselves out, what they want to do. They really seem to have their ducks in a row,” he said. Rivian spokesperson Michael McHale declined to disclose how many preorders they’ve received for the R1S or the companion pickup truck, called the R1T, in the past two weeks. “It’s easily exceeded (our) best expectations,” McHale said via email. Some have been surprised by the price tag. The SUV will start at $72,500, with the pickup at $69,000, before any federal or state tax incentives. More expensive models with larger battery packs will be produced first. Those prices are not yet known. The price was the biggest sticking point for Scott Preston, a Normal Town Council member who preordered the SUV too. “There’s certainly a chance that once production actually begins in 2020, I may end up being pressed out of the market. They very could well be more than I’m able to spend on a vehicle once we get to that point,” Preston said. But Preston said he felt comfortable pulling the $1,000 trigger because the deposit is refundable. “That ease of cancellation … gave me more peace of mind,” Preston said. The price wasn’t a turnoff for Ariel Fernandez, who lives in Coral Gables, Florida. He’s preordered the SUV too. Fernandez said, yes, the Chevy Tahoe and GMC Yukon SUVs are cheaper—starting at around $49,000. But there’s a trade-off. “But you’re also talking about a (vehicle) where you’re going to have to put in a lot of money in gas. And it’s something we’re doing to help the environment,” he said. Fernandez, who works in business consulting, said his concern for the environment is a big deal. His family recently put solar panels on their home. "I'm willing to invest in this company and put my trust in them." But functionality was also important. Fernandez said he was impressed by the battery life and range of Rivian’s vehicles. The version of the SUV with the largest battery pack will be able to travel over 410 miles on a single charge. Fernandez said that will come in handy as his family drives between their home near Miami and Orlando (around 250 miles away), or even up to their second residence in Tennessee. He also has a 3-year-old son who, like most kids, comes with a lot of toy-related baggage. “Anytime we travel, we need the space. The cargo space on the R1S was substantially larger than the Tesla (Model X SUV), so that was something that attracted us,” he said. It’s famously difficult to launch a new car company, even in an EV market that’s expected to grow rapidly in the next decade. Other EV startups have flamed out, like Faraday Future. Even market-leader Tesla has struggled to deliver on time. Fernandez said he’d never heard of Rivian before its reveal at the LA Auto Show. So is he worried that Rivian will be able to deliver what it promised? Put my deposit down for an R1S today. Excited to come along on this journey with you and the team! Smieszek said Tesla’s success is the outlier—not the norm. “I stay pretty (informed) and if I got nervous, I’d probably pull that deposit,” he said. “But after researching he company, and seeing the measured pace at which they’re moving, I don’t feel like this is a flash in the pan with a low likelihood of making it to market. “This seems to be very planned out. The auto executives on that (Rivian) team that they’ve brought in from other companies know what they’re doing. It smells like something that could be successful,” Smieszek added. Rivian’s plans to build its vehicles in the U.S. is another selling point for Fernandez. During an interview with GLT, Fernandez was well aware of the Normal manufacturing plant’s up-and-down history with Mitsubishi. He said he’s happy to see Illinois getting an economic boost from Rivian recycling the plant in this way. Fernandez’s grandparents were Cuban immigrants. From his grandfather he inherited a “Buy American” mantra when shopping for a car. “Sometimes the Japanese and Korean vehicles are a bit cheaper, but we always make the investment int eh country that accepted our family and where we live,” he said. Preston too wanted to support what Rivian was doing locally. “And I love that they are not only doing things here, but that they’re in a very innovative space and industry, looking at an all-electric SUV and truck,” Preston said. His new Rivian SUV would become his primary day-to-day vehicle around town. Smieszek, Fernandez, and Preston may have different slightly reasons for buying a Rivian. But one thing they have in common: It will be their first electric vehicle. GLT's story about Rivian customers. There's no guarantee of success in the auto industry, especially for an electric vehicle startup like Rivian. But there was a moment when John Shook from Rivian's board of directors knew it was in good hands.